"Congratulations, new owner of a Mossby's Model D3 Extra-Small Magic Carpet, Especially for Young or Vertically Challenged People. Not sure where to start? Never fear, our Mossby's Magic Carpet Handbook contains all the information you need to navigate the skies, deal with altitude, wind, and weather, and triumph in tough situations. In no time, we'll have you ready to meet fellow carpet riders (and the occasional annoyed goose), sample unusual food, and visit the people, animals, and landmarks of the world ..."
So advertises the mysterious book you've just received in the mail, from a great aunt you've never met. Paging through, you find it filled with not only handy instructions, but your great aunt's handwritten notes. More exciting still, she promises that, when you've proven yourself ready, her magic carpet will be all yours But there's no time to waste. Only your great aunt can tell you the Magic Word that makes the carpet fly, and she's getting, uh, just a tad forgetful. Can you learn what's in the handbook in time? Will you be ready to embark on high-flying adventures around the world? And if you think you will be, just how worried should you be about these words from the handbook? "WARNING: Mossby's products are only for people who have the skills, bravery, and all-around derring-do to handle magical objects. Remember: with great adventure comes great danger." Having grown up in rainy Seattle, ILONA BRAY knows the importance of entering a world of imagination through books. Her real-world adventures have taken her around the globe: studying philosophy at a small women's college in Pennsylvania, canning salmon in Alaska, representing immigrants and refugees in San Francisco (yes, she's a lawyer, too), and traveling to far-flung destinations like Turkey, Guatemala, China, and Lithuania. She now focuses on writing books for both adults and children--and, of course, on working her way up from the position of assistant magicalist at Mossby's Magical Objects Ltd. ALEJANDRO LEE holds a bachelor's degree in fine arts from the Art Center College of Design. He has over 8 years of experience in creating pre-production storyboards and concept art for Hollywood area clients. He was a nominee for the 2015 Russ Manning Award for new graphic novelists. 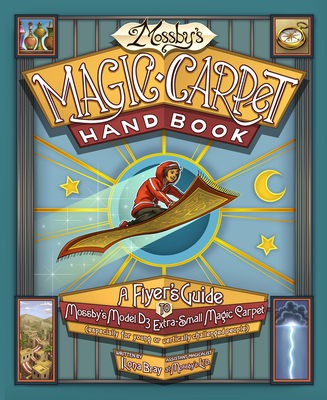 Mossby's Magic Carpet Handbook is the first children's book he's illustrated.